Guide fee, guide's expenses, group climbing equipment and camping gear, guide's portion of water taxi. Transportation to and from trailhead, Ross Lake Resort Water Taxi, personal food, personal climbing equipment, trailhead parking pass fees. Fred Beckey nailed it when we said, "More than any other peak, Mt. Fury epitomizes the grand alpine wilderness of the amazing picket range." Mt. Fury is in the Northern Picket range in North Cascades National Park. While the climb is relatively straight forward from a technical standpoint a long approach and a significant amount of exposed and complex climbing, hiking, and scrambling are involved in any ascent. Climbs in the Northern Picket Range are a bit harder to reach than climbs in the Southern Pickets (Degenhart, Terror, Inspiration, etc.) but the reward is an exquisite wilderness experience. The approach begins on a nice trail and ends at a very spacious and well appointed camp. Once off trail and above treeline we usually see black bears and we almost never see other climbers. 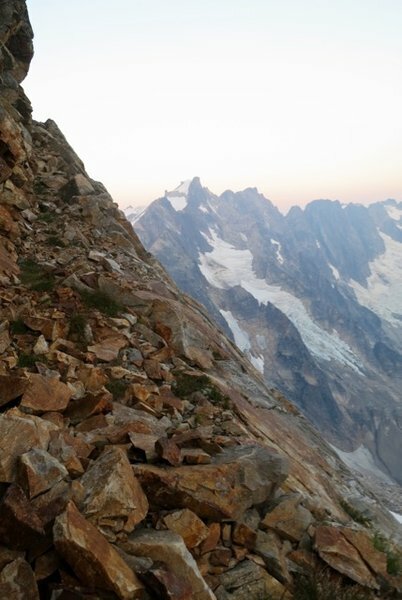 The chief obstacles on the route can all be overcome by scrambling but the aura of the place is more serious than more typical PNW glacier climbs. 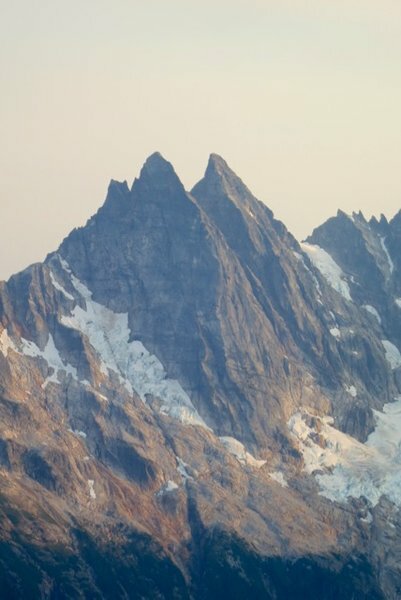 This in an ideal climb for fit people looking for an almost Alaskan adventure in the lower 48. 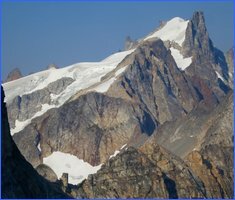 Our climb utilizes the SE Glacier Route and ends at the East Summit. Gaining the West Summit is a more complicated affair and while possible is done much less often. In the summer of 2015 we successfully guides two groups up Fury in early August. Why climb Mt. Fury? In our experience this is about as remote, wild, and scenic as any spot in the Western US. 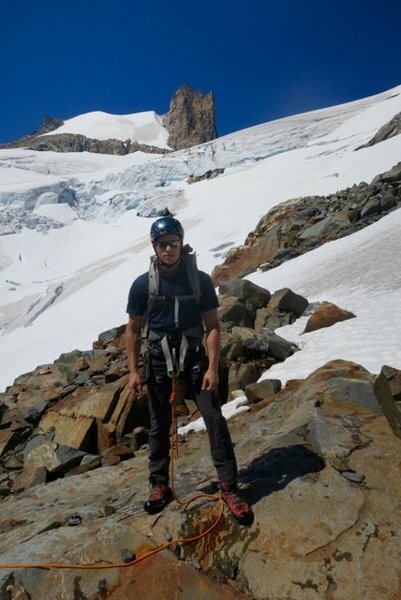 This is a very different experience from a climb of more popular peaks in the area such as Shuksan or even Forbidden and is always a magic experience for both the guides and the clients. The summit day on Mt. Fury is a long and complicated affair. From Luna High Camp we climb an easy rock pitch and then follow a very perfect, but improbable looking ledge traverse before descending and following a long ridge before descending steep gullies and working our way onto a long traverse. The summit climb itself involves a mixture of rock scrambling, hiking, and then ends with steep glacier climbing surrounded by stunning scenery. When we hit the tiny summit we reverse the entire thing and then hope to move our camp lower to facilitate the exit to Big Beaver the following day. We like to use the Ross Lake Water Taxi to cut off the 6-mile hike to Big Beaver along Ross Lake. The fare is $60 each way and we split the cost among the total group, including a share for the guide. Once you see how far it is we think you will agree it is worth every dime. The Ross Lake Taxi picks us up on the shore of Ross Lake a 20 minute hike from the car along US Highway 20. This seems to go best from mid-July until late August. In some years September can be perfect, but only if you have good stable weather. This is a climb for people with previous climbing experience. We work very hard to carry lightweight gear and leave most of the frills at home, but we still need the usual climbing gear such as ice axe, crampons, harness, and clothing for foul weather. You need to have a good level of fitness for this climb. We can guide this at up to a 2:1 ratio. Cascade Climbers Trip report of a 25 hour RT climb! Want to do other climbs in the Picket Range? We love this area and with the right customer we will generally do whatever it takes to make it happen. In addition to Fury we have also guided Inspiration, Degenhardt, terror, and Triumph in recent summers. If you have a dream climb and want to discuss possibilities, feel free to give us a call at 509-548-5823.